For a series of recent talks I’ve given, I’ve been thinking about the changing expectations that people have for services that are ‘digital’. Services are a familiar part of our lives and our expectations for how they should work are continuously changing. I believe that people’s expectations of services have been rising immeasurably, and this is all because of the internet. The challenge here is for every organisation to start delivering services that meet people’s new levels of expectation. These are ‘digital’ services with different sets of qualities or values. Built from an understanding of the potential that new technologies have to solve real problems for people. They’re what I’ve started describing as services that are ‘of the internet’. Services that are fit for the digital age we live in. Many of the services we use in our everyday lives were designed before the internet, especially services that are part of large or public institutions. These services are often the result of technology built on top of analogue processes that have remained unchanged, sometimes for years, decades, or longer. In our daily lives, many of the services we use are also much less digital then we’ve come to expect. Royal Mail (an early example of a messaging service) is the first ‘service’ I can remember using as a child. It’s something that we’re all familiar with and we have an expectation for how it should work. But it still functions almost identically to how it was first designed, matching the same expectations I had of it as a child. In this example, technology has enabled efficiencies in the sorting and distribution of mail but this hasn’t changed how physical messaging and mail distribution functions. Any changes over time have been the result of technology built on top of the original service blueprint. You can find similar examples throughout our public institutions. Government is full of them. Take the NHS and the recent cyber attacks on its computer and records systems, which meant that doctors and nurses had to revert back to paper processes and manual record keeping. In these instances, when the technology eventually breaks, all you’re left with is an analogue process. Only now are we starting to see teams in NHS Digital question what it really means to deliver a digital NHS. To succeed they have to think fundamentally about what it means to deliver healthcare in the digital age, not just technology for healthcare. If the expectations for the services we use everyday have changed because of technology, it’s this evolving technology that gives us the opportunity to design and deliver services in new ways. In fact, I would argue that building technology on top of analogue services is no longer a viable option at all. It simply doesn’t scale well and will eventually break. Most large public institutions are no longer able to adapt fast enough to the changing needs and expectations in society. This is the result of the increasing challenges of delivering services that meet user needs, both in terms of fairness and equity. We face delivery challenges of reducing cost versus delivering real value in increasingly complicated individual sets of circumstances. None of this ever stands still and services and policy responses (for government) need to be more adaptable than ever to respond appropriately. In the private sector the challenge is similar. Large organisations are struggling to orient themselves around services that deliver enough value to keep hold of existing customers or enable them to increase their share of increasingly competitive markets. All of this is happening with the pressure to reduce costs and the need to deliver more value for less. As a response to this, I’ve been trying to define the qualities or values that I think are ‘of the internet’. As a starting point, I’ve been thinking about the services offered by companies like Google, Uber, Amazon, Airbnb and Monzo. These are all examples of services that I think bring together the culture, mindset and technologies of our internet era. I can also access all of these through my smartphone. I don’t think this list is perfect, but its started some good conversations so far. This means making entire experiences and specific flows of data seamless across multiple channels and interactions. It also means that there is no longer an excuse for a service not to be usable or accessible to everyone. This means making experiences adaptable and highly-tailored to meet individual needs and circumstances, that are scalable and sustainable because of technology. It might also mean removing physical or fixed-point interactions in response to individual preference. This means making services that are instant, accessible and open to everyone at any time, without conditions attached (or, if conditions are essential, they are clearly explained). This might also mean making services that are more open about the intent of what they deliver (eg policy in government). This means making services that use personal data in a transparent way, based on explicit consent. It also means being clear about the ‘value exchange’ taking place (we actually pay for many services we consider free eg with Facebook and Google we exchange our data for access to their services). This means making services that increasingly consist of a single interaction, or that result in an instant outcome eg getting a payment into your account. This means making services that include levels of automation and therefore reduce human error and mistakes. Automation enables us to focus human skills and attention where it’s most needed – with the people who need or want highly-tailored or responsive support. All the things I’ve listed here are not only attributes of smartphone apps and websites. They’re also things that we’re starting to see reflected back in the design of our physical spaces and experiences. This is another result of the raised expectations we have of interacting with internet-era companies. The Apple Store. Setting new expectations for a retail experience. 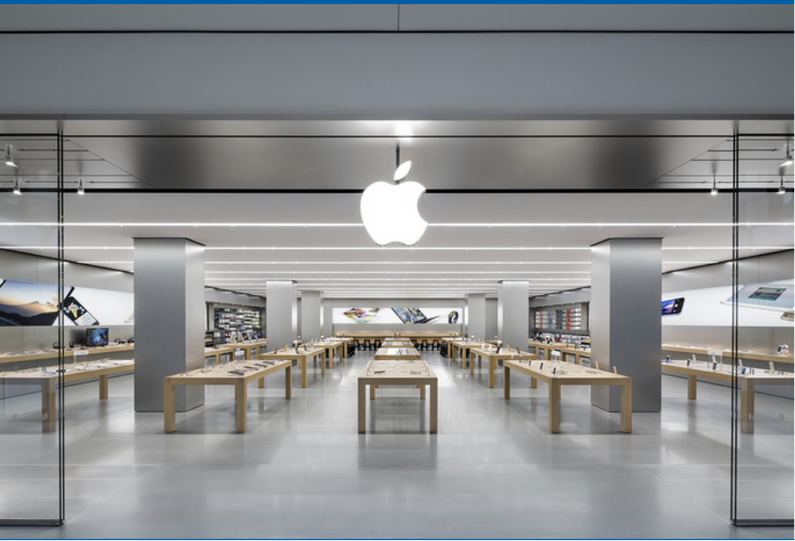 The Apple Store experience is a great example. It feels like an internet experience: highly tailored and personal, with its ‘genius bar’ appointments and personal assistants. There are no physical cash points, and everything is adaptable and responsive to the products in the store. Likewise, it’s interesting to see Amazon now experimenting with physical bookstores and using data from online retailing to shape their physical store spaces and experience, as this BBC news article describes. I noticed recently that the hotel chain IBIS have started reshaping the physical spaces in their reception areas to be more like the experience you would have somewhere like an Apple Store. They now have roaming customer support staff who help people check in, providing an individual level of service and information using the portable devices they carry, rather than asking customers to queue at a traditional hotel reception desk. Physical spaces and interactions within services are important. No fully end-to-end experience exists in a single channel (either online or offline). And no one I know wants to live in a virtual world with no human contact. Both physical and virtual interactions need to be considered carefully when we think about meeting people’s raised expectations for ‘digital’ services. Is your service vision fit for the digital age? I believe that in order to meet great expectations we must start to set out ambitious goals for people to work towards, capturing more of what it means to be ‘of the internet’. Something I’ve been trying to help teams with in government is creating meaningful long-term goals that think hard about what it means to be digital. I’ve talked about this before as having a mission. This is an ideal future state or vision for the service that we’re working to deliver. It should describe clearly what a team or organisation is trying to achieve. At DWP Digital Melanie Cannon has written about the practicalities of helping teams write a mission statement, which is a good place to start. The challenge is then to question just how digital your long-terms goals are. In my 4 years in government the biggest challenge has been moving beyond the digitisation of existing analogue services. In an era where you can apply for a loan and get paid in days, or even hours, government can no longer expect to take up to 6 months to process a visa application or an application for financial support, no matter how complex the individual circumstances. Technology now enables us to design better processes and to provide better individual levels of service that mean our public services can and should be completely reimagined. 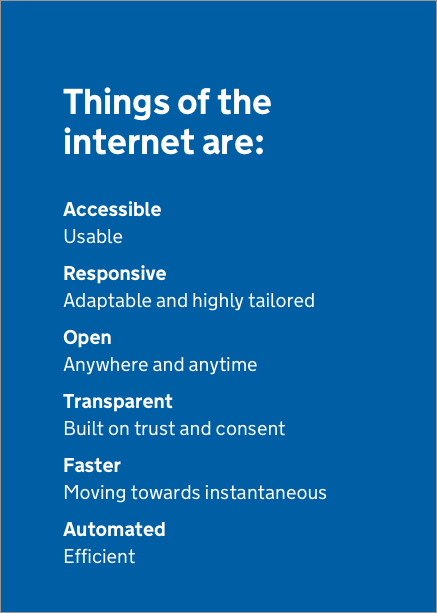 The things ‘of the internet’ I’ve started with here all focus on on the positives of what technology can do for people. It’s a question that starts with user needs and not technology in and of itself. We know the internet has dark patterns. These are not things that I think the internet was intended for and I believe this is why discussing the long-term goals or the vision for our services is such an important conversation. I’ve used examples here from companies who might have ethics, a culture or business processes that you question. This is a separate conversation about the values we start to attribute to things we hold up as examples of good digital services that meet people’s expectations. The positives I’ve outlined here can also become negatives. Digital can result in a lack of constraint. Think about unlimited news feeds and information flows. A lack of constraint might make individual situations or problems worse if someone is overwhelmed by choice or doesn’t have the clarity of information they need to work through a problem or situation in their life. It’s important that we think carefully about the appropriate response to different situations when we think about our vision for future products and services. Good design is always about the application and appropriate use of constraint. Finally, I’ve purposefully avoided talking too much about convenience here. I don’t think convenience is ‘of the internet’. I think convenience is a privilege that pre-dates the internet rather than a problem that we’re looking to solve with technology. I’ve increasingly started to notice examples of things that are ‘of the internet’ – from startups to existing services, and organisations beginning to reinvent themselves. I’ll share more of these as I collect them. I would also love your feedback on how we can design more meaningful services for the digital age, especially in our public institutions. Get in touch. You can download a ‘things of the internet’ poster here to start the conversation in your organisation.